In a small bowl, stir together 1 tbsp sugar, yeast and warm water until yeast is dissolved. Let stand 5 minutes until foamy. Melt 3/4 of a stick of butter in a small saucepan. Add milk and heat until lukewarm. Pour mixture into a large bowl and add yeast mixture, remaining sugar, bread flour and salt. Stir with a wooden spoon until just combined. Add and stir in 3/4 cup all-purpose flour, and dump dough onto counter. Knead and keeping adding flour a tablespoon at a time until dough is smooth and just slightly sticky, about 10 minutes. Form dough into a ball and place in a greased bowl, turning to coat. Cover with a towel and let rise until doubled, about 1 hour. Divide dough into 20 pieces and roll into balls. Arrange evenly on a baking sheet and cover with a towel until almost doubled, about 45 minutes. Meanwhile, preheat oven to 375°F. When rolls are risen, use a floured chopstick or edge of a ruler to make a deep crease down the center of each roll. Let rolls rise, covered, about 15 more minutes. Melt the remaining 2 tbsp of butter and brush the tops of the rolls with the butter. Place rolls in the oven 20-25 minutes, or until golden brown. Cool rolls in the pan 5 minutes, then remove and serve warm. 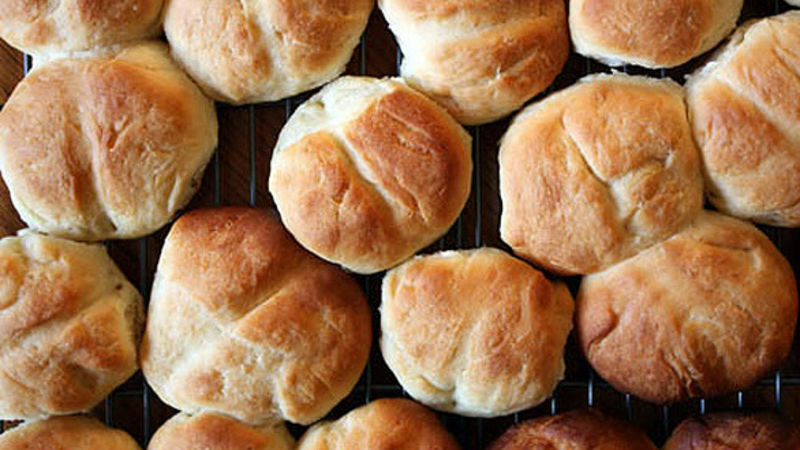 Whenever I make these Parker House Rolls, I feel like I’ve stepped onto the set of “Mad Men.” I feel like donning a dress, pearls and heels and twisting my hair up into a beehive bun – all just to step into the kitchen and bake. Of course, this never actually happens, but the Parker House Rolls have been a reality many times. This is mostly because they’re so delicious, and even more so because they’re very easy to make. These rolls are a lot like the Pull-Apart Rolls I made for Thanksgiving this year, only they’re not the same shape, nor are they baked close together to get that “pull-apart” effect (though they could be, if you like that sort of thing). They maintain the same buttery, flaky texture of a classic dinner roll and are perfect for accompanying your upcoming Christmas meal. Considering they require little effort to prepare and freeze really well for up to a few weeks, you can make them whenever you have a few extra minutes to spare and freeze them until your holiday celebration. Heck, if you want, you can even use the time you’ve saved making these rolls to dress up “Mad Men” style for Christmas. That is, if you want to. To me, heels in the kitchen are never required.